Dallas–Fort Worth celebrates July Fourth as only Texans can—in a big way—so if you're planning a visit this time of year, you've picked the perfect place to celebrate the Fourth. 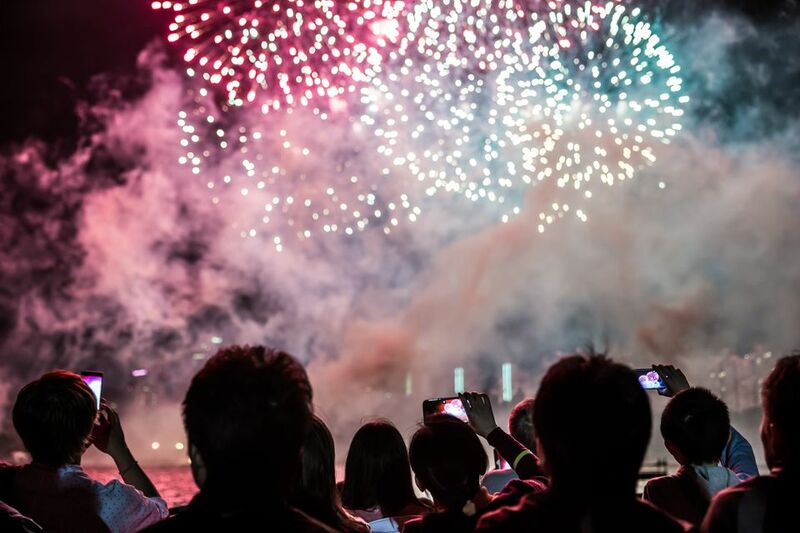 Dozens of Independence Day celebrations are planned, all topped off with spectacular fireworks displays. From parades to concerts to barbecues, you're sure to get your fireworks fix at one of these Fourth of July events in the Dallas–Fort Worth area. What: Kaboom Town! produces one of the country's top fireworks displays. See the air show, listen to the Dallas Wind Symphony, and take some carnival rides. The best place to watch the fireworks is in the midway area or you can view them at one of the many watch parties at area restaurants. After the fireworks display, stick around for a concert. When: July 3 at 5 p.m. Fireworks start at 9:30 p.m.
What: The City of Allen keeps its annual tradition of being "First to the Fourth" by kicking off Independence Day festivities on June 30. This festival focuses on the military and includes military vehicles on display and a military salute. It also boasts one of the largest fireworks displays in Texas. Attractions include sports competitions, line dancing, dinosaur animatronic exhibits, kids' crafts, a water playground, and live music. When: June 30 at 4 p.m. Fireworks start at 10:05 p.m.
What: Enjoy roller coasters, carnival food, live entertainment, and a nightly patriotic foam dance party at this large amusement park. When: June 30–July 4 from 10:30 a.m. to 10 p.m. Cost: $60.99 advance online tickets or $78.99 at the park. Save big online using promo code "COKE" when purchasing advance tickets or bring a Coca-Cola to the park to get discounted admission. What: What's more American than baseball? Celebrate July Fourth watching the Texas Rangers take on the Houston Astros. After the game, stick around for the fireworks display. When: July 4 at 6:05 p.m. Cost: Check the Rangers' website for ticket information. What: Spend the Fourth of July with country music legend Willie Nelson at his annual Independence Day concert. Willie has hosted this music-filled event since 1973. This year features performances by Sturgill Simpson, The Head and The Heart, Ryan Bingham, Edie Brickell & New Bohemians, Margo Price, and more. When: July 4 at 11 a.m. Cost: General admission lawn tickets start at $42.50. Purchase tickets ​here. What: The City of Bedford celebrates Independence Day with 4thFEST, a free celebration featuring live music, a variety of themed family-friendly activities, a classic car show, carnival food, a salute to soldiers, and, of course, a spectacular fireworks show when the sun goes down. When: July 4 at noon. Fireworks start at 10 p.m. Cost: Free but the Splash Aquatic Center and InflataFUN area charge admission. What: Enjoy live music, patriotic performances, water activities, rides, games, museums, kids' activities, and food trucks within the State Fair of Texas Midway. If you can't make it to the fireworks display in Dallas, tune in to WFAA-TV Channel 8 at 9 p.m. When: July 4 from noon to 10:30 p.m. Fireworks start at 9:45 p.m. Cost: Fireworks are free but access to the State Fair Midway requires an admission fee. What: The Kiwanis Club hosts this celebration featuring live music, concessions, children's activities, and an awesome array of fireworks that light up the sky. Event proceeds help fund youth services such as the Denton Kiwanis Club Children's Clinic. When: July 4 at 7 p.m. Fireworks start at 9:30 p.m. Cost: Free but parking is $10. What: The Farmers Branch celebration hosts patriotic festivities featuring a dance band, kids' zone with a bounce house, and more family-friendly fun. Food includes barbecue along with carnival favorites. Save room for Uncle Willie's award-winning pies, cakes, cookies, ​and brownies. Outside food and non-alcoholic beverages are allowed. Get there early, because gates close when the park reaches capacity. When: July 3 at 6:30 p.m. Fireworks at 9:30 p.m. Cost: Free for residents. $5 for non-residents. What: The Town of Flower Mound presents Independence Fest, which kicks off with a children's parade and finishes with a fantastic fireworks finale. This year's highlight is a free concert by Pat Green. Activities include a vintage car show, kids' zone with bounce houses, face painting, and concessions. Note: There's no onsite parking. When: July 4 at 5 p.m. Fireworks start at 9:50 p.m.
Where: Bakersfield Park, 1201 Duncan Lane, Flower Mound, TX 75028. The parade starts at 10 a.m. at the Lewisville ISD School Administration Building at 1800 Timber Creek Road. What: Fort Worth's Fourth takes place at Panther Island Pavilion along the Trinity River and features North Texas' biggest fireworks display. Attractions include live music, pony rides, tubing, zip-lining, water slides, an F-16 flyover, and a local band competition. When: July 4 at 2 p.m. Fireworks start at 10 p.m.
What: Celebrate Independence Day at one of Fort Worth's favorite traditions. Pack a picnic and come to hear the Fort Worth Symphony Orchestra perform patriotic pieces conducted by Alejandro Gómez Guillén. These concerts are popular, so reserve a table or buy general admission lawn tickets soon. When: July 2 to 4 at 8:15 p.m. Fireworks start after the concert. Cost: $25 and up. Advance tickets and parking passes are available on its website. What: Party in the Plaza festivities will feature even more of all the family favorites of the past including a community stage and a children's expo. The expo includes hamster ball races, zip lines, rock climbing, and bungees. The hometown heroes exhibit honors Frisco's finest men and women of the fire and police departments along with the equipment used to keep the community safe. The Taste of Frisco dishes up fare from local food vendors. When: July 4 at 4 p.m. Fireworks start at approximately 10 p.m.
What: Bring the family to the horse races at Lone Star Park for its Lone Stars & Stripes Celebration. Kids will enjoy the Family Fun Park featuring bounce houses, pony rides, and a petting zoo. A live band will play between races on the Courtyard of Champions stage. After the last race, stick around for the firework display choreographed to music. When: July 3 and 4 at 3 p.m. First live race starts at 5 p.m. Cost: Visit the website for ticket information. What: The City of Hurst is proud to present its annual Independence Day celebration at Hurst Community Park. Activities include face painting, inflatables, live music, and food courts. Note: There is no onsite parking. A free shuttle service is provided in front of Nordstrom. When: July 4 at 5 p.m. Fireworks start at 9:30 p.m.
What: Join the City of Irving for its annual two-part Independence Day celebration. At 9 a.m., its award-winning parade begins in the Heritage District. Following the parade, a reception lasts until noon at Heritage Park and features live music and children's activities. Finish the day at Lake Carolyn at 6 p.m. for the evening festivities. You'll find food vendors, live music, a kids' fun zone, and a 20-minute fireworks display at 9:30 p.m. Cost: All events are free. What: Lake Grapevine continues its annual July Fourth fireworks display, which starts at 9:30 p.m. Be prepared for a spectacular fireworks show, which can be viewed from any lakeside location as well as several other spots throughout Grapevine. When: July 4. Fireworks start at 9:30 p.m. Cost: Admission is free at most viewing locations. Some parks and businesses along Lake Grapevine may charge admission. A parking fee may also be charged. What: Activities at this annual family-friendly event include games, rides, bounce houses, a water slide, face painters, and live music. Food trucks will be there, but you can also get food at the Village Shops restaurants. Get there early to claim your fireworks viewing spot on the lawn along Lake Avalon. When: July 4 at 5:30 p.m. Fireworks start at 9:30 p.m.
What: Come to Lewisville for its Red, White, and Lewisville concert and fireworks display. Musical artists include Sarah Lee-Anna Hobbs and Desperado (an Eagles tribute band). The event features carnival activities and a farmers market. Food vendors will serve up barbecue, shaved ice, and ice cream. When: July 4 from 6 p.m. Fireworks start at 9:30 p.m.
What: On the shores of Lake Lewisville, the Town of Little Elm will host its annual Independence Day Celebration, July Jubilee. This family-oriented celebration will include food and merchandise vendors, live music, and kids' activities. The evening concludes with a spectacular fireworks display over the lake. Cost: Free, but there is a parking fee. McKinney: Red, White, and BOOM! What: The City of McKinney kicks off its Red, White, and BOOM! celebration with a parade at 10 a.m. followed by a block party and classic car show in historic downtown. In the evening, head to the McKinney Soccer Complex at Craig Ranch for food, music, kids’ activities, and fireworks. When: July 4. Downtown parade at 10 a.m. Fireworks start at 9:45 p.m.
What: The City of Plano hosts this Fourth of July celebration featuring food trucks, a DJ starting at 7:30 p.m., and fireworks. The display is accompanied by patriotic music simulcast on radio station 97.5 KLAK. What: The City of Richardson presents its annual Family 4th Celebration at Breckinridge Park, which features a 10-acre lake and plenty of picnic areas. Live music includes the city's community band performing a patriotic salute. Kids will want to check out the bounce houses and climbing wall. Concessions will also be available. When: July 4 at 6 p.m. Fireworks start at 9:30 p.m.
What: Southlake's Independence Day party takes place in several parks in the Southlake Town Square area. The Southlake Community Band begins the celebration with a patriotic performance in Family Park. Kid-friendly attractions include crafts, inflatables, balloon artists, a trampoline, and candy art. Some of the best viewing spots for fireworks are at Frank Edgar Cornish, IV Park, McPherson Park, and Park Village. When: July 3 at 6 p.m. Fireworks start at 9:30 p.m.
What: The annual Liberty by the Lake festivities begin at 7:45 a.m. with a one-mile fun run followed by 5K and 10K runs. The annual parade starts at 10 a.m. Festivities start back up at 4 p.m. and include a BMX stunt show, dog show, science show, and a watermelon-eating contest. If you have kids, head to the Family Fun Zone, which features obstacle courses, train rides, face painting, and bounce houses. At 9:30 p.m., the fireworks show starts and will be set to patriotic music that can also be heard on 99.9 FM. When: July 4 at 4 p.m. Fireworks at 9:30 p.m.